I simply CANNOT believe it has been half a decade since this magical night. I also cannot believe I'm at a stage of life where many dear friends and readers of this blog did not know me then! Our friendship was a mere twinkle in Fate's eye when this occurred. 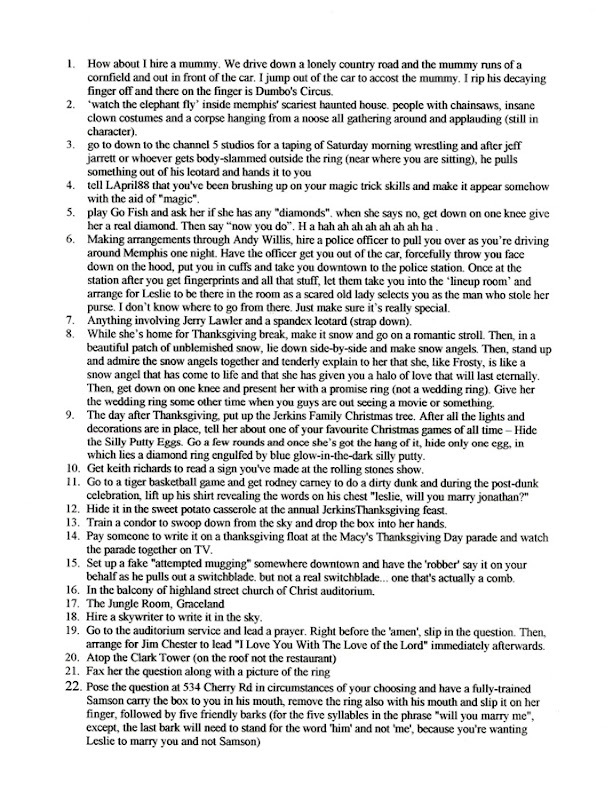 I did some snooping around in my old Leslie Guinn email archives, and dusted up my then-version of Jonathan's proposal of marriage I'd sent some friends. It's funny to read this now because a) I forgot a few details (like the ice cream question? why in the world wouldn't I have already known his favorite ice cream flavor?) and b) I lived in Austin then. It's funny that we got engaged and then I left to go back to school. Honestly, it's funny in general that we didn't used to be married. It feels like we always have (in the best way). Jonathan and I got engaged Friday night, Oct. 28th! He took me to on our "first date" again- Memphis Pizza Cafe, then Super Mario Brothers 1 and the Saved by the Bell board game, and me wearing a green shirt with a bird on it. So on Friday, I'm wearing the bird shirt (at his behest), we went to Memphis Pizza Cafe and even sat at the same table as the first date. Then we went to his house, where we played Super Mario Brothers, and then he said, "Let's ask each other questions" - because in the Saved by the Bell board game, there is a deck of questions that are a mix of trivia and what would you do?-type questions, like, "What would you do if the head cheerleader found out you kissed her boyfriend?" and stuff like that. On our first date, this question-asking morphed into just asking questions back and forth about each other. So this past Friday, he said, "Let's ask each other questions" - and every question you ask you also have to answer. So he was asking questions like, "When did you know you first loved me?" and answering them. I was so oblivious. In the middle of all of his sweet answers, I asked what was his favorite ice cream flavor. After that, he said, "I don't like your question. So I have another question for you." Then he pulled the ring out of the couch cushion, got down on one knee, and said, "Will you marry me, Leslie Guinn?" 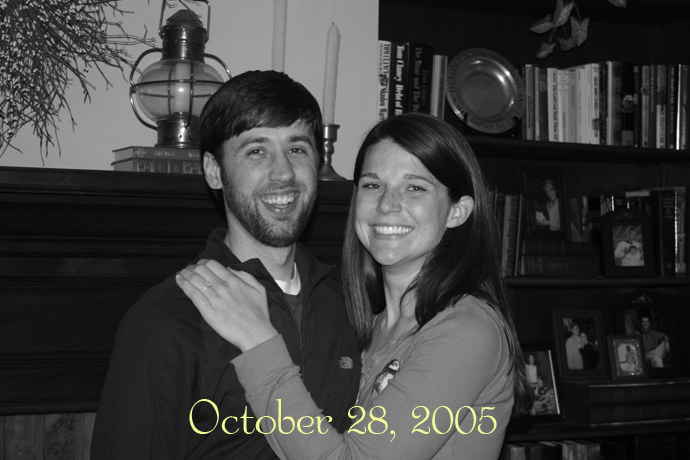 Then we had a surprise (well, surprise only for me) engagement party at his parents' house. It was so perfect- laid back and sweet and wonderful. We are so excited. Obviously, anything involving Super Mario Brothers I, the Saved by the Bell board game, and a bird shirt has to be good. Also, it's funny to me now that at first, I was open to getting married on my birthday. What a nincompoop. Our anniversary is 4/22, and thank goodness, because a doubled-up Leslie holiday would've been a long-term disaster. And #17. And #8. Bahaahaaa. I just cannot imagine my life without that guy. PS I have the Saved By the Bell boardgame.